Turn photos into oil painting, it means to make ourselve to unique exclusive art treasure and become good memory. It is not comparable with ordinary wedding photos or artistic photos, because it is not only memorable, but also with very artistic sense and can revel us in high-grade. As we all know, custom oil painting is a kind of painting than can show aristocratic atmosphere, it is pure hand-made and with unique style. 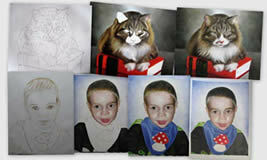 Meanwhile, we can also copy orcustom oil painting according to customer's requirement. Some customers may be confused who they should choose to order an custom oil painting, website or artist from painting studio? First, let's analyze the advantage and disadvantage for the 2 options. Advantage: We can see the artist and talk with him face by face. Disadvantage: The custom oil painting price will not be competitive, as most of them may transfer the order to other artist to paint. Disadvantage: We can not see the artist and may worry about the quality. Since custom oil painting website has good credit, it's better to choose website to place the order. As custom oil painting price from studio will be high as they need to invest more to the shop. Besides, it's more convenient for us to find a reliable custom oil painting website from the internet. 2. Whether they are working studio of custom oil painting, this is very important. If not, the custom oil painting price and quality will be reliable. 3. Whether they have custom oil painting pricelist on website, the payment address is reliable or not? Make sure not pay whole payment at one time. 4. Whether the website is authorized, this is very important. 5. Whether they any updated custom oil painting example on the website, if yes, it means the business is active. 6. Whether we can custom oil painting online, such as choose the size and painting type. Whether the payment address is to the third party rather than person account. What cost of Custom Oil Painting? The Custom Oil Painting price is decided by themes and size of the painting. The more complex and larger size of the subject, the more expensive the price will be. On PortraitPaintingShop website, the Custom Oil Painting price is generally from $70 including shipping cost. You can find more Custom Oil Painting Price on our website http://www.portraitpaintingshop.com/price.asp. PortraitPaintingShop website has been engaged in Custom Oil Painting for 15 years, most of the Custom Oil Painting are sold to western counties. All the artists are professional and have the experience of more than 10 years. The Custom Oil Painting we sold include celebrities in America and European countries. We are the supplier of the world's Oil Painting From Photo gallery, and they sold our Custom Oil Painting to customers in western coutries, with the best quality.